Sara Ali Khan (pronounced [saːɾaː əˈli ˈxaːn]; born 12 August 1995) is an Indian actress who works in Hindi films. A member of the Pataudi family, she is the daughter of actors Amrita Singh and Saif Ali Khan and the paternal granddaughter of Mansoor Ali Khan Pataudi and Sharmila Tagore. After graduating from Columbia University, Khan ventured into acting by playing the leading lady in the 2018 films Kedarnath and Simmba. Both films were commercially successful and the former earned her the Filmfare Award for Best Female Debut. 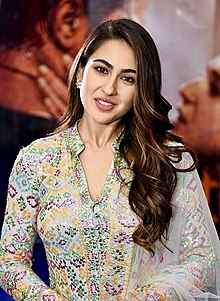 Sara Ali Khan was born on 12 August 1995 in Mumbai to Saif Ali Khan, son of Mansoor Ali Khan Pataudi and Sharmila Tagore, and Amrita Singh; both actors of the Hindi film industry. A member of the Pataudi family, she is also the maternal granddaughter of Rukhsana Sultana and Shivinder Singh Virk. She has a younger brother, Ibrahim Ali Khan. Her half-brother, Taimur Ali Khan, is Saif's son from his second marriage to Kareena Kapoor. Khan is of predominantly Bengali and Pathan descent on her father's side, and of Punjabi descent on her mother's side. When Khan was a four year-old, she acted in an advertisement. According to Saif, the actress Aishwarya Rai proved to be her inspiration for pursuing a career in film after she saw her perform on stage at Chicago. In 2004, when Khan was nine, her parents divorced, and Singh was granted legal guardianship of her children. Saif was initially not allowed to see her or her brother; they have since reconciled, and, according to Saif, "are more like friends [than father and daughter]". Khan also shares a healthy relationship with Kapoor, her step-mother; she stated in 2018, "I would like to imbibe her professionalism in me". As a teenager, Khan struggled with her weight, and had to undergo daily workouts under a strict schedule to get fit. She was also diagnosed with polycystic ovary syndrome, which she ascribes as a cause for her weight gain. Khan studied history and political science at Columbia University in New York. In 2016, she completed her graduation early, within three years, and took off the remaining one-and-a-half years for weight training, following which she returned to India. Khan's debut came in 2018 with the Abhishek Kapoor-directed inter-faith romance Kedarnath, in which she played a Hindu girl who falls in love with a Muslim porter played by Sushant Singh Rajput. In preparation for her role, Khan improved her knowledge of Hindi vocabulary with help from Rajput. In February 2018, a dispute between Kapoor and KriArj Entertainment, the producers, led to the latter losing the film's rights to RSVP Movies, who produced it alongside Kapoor. A few weeks before release, priests of Kedarnath Temple demanded the film's boycott as they believed it promoted Love Jihad, and a Bharatiya Janata Party leader also urged for a ban. As a result, the film was banned in the state of Uttarakhand. Kedarnath received mixed reviews with praise directed to Khan's performance. Kunal Guha of Mumbai Mirror found it to be a rehash of 1980s Hindi films but appreciated Khan's act: "When her Mukku is angry, hopeful, desperate or coltish, she often conveys it through her eyes alone — giving us a taste of the diverse faces she can throw on." Meena Iyer of Daily News and Analysis similarly wrote, "It is hard to believe that this is [Khan's] first film because she is so spectacular". Kedarnath grossed over ₹966 million (US$13 million) worldwide against a budget of ₹350 million (US$4.9 million) to emerge as a commercial success. Khan was awarded with the Filmfare Award for Best Female Debut. A few weeks after the release of Kedarnath, Khan starred in Rohit Shetty's action film Simmba, alongside Ranveer Singh, which was loosely based on the Telugu-language film Temper (2015). She began work on it when filming of Kedarnath was temporarily suspended. This led to Abhishek Kapoor suing Khan; they later settled out of court when she agreed to split her time between both films. Reviewing the film for The Times of India, Ronak Kotecha opined that Khan had "precious little to do besides looking breathtakingly beautiful" and disliked the chemistry between her and Singh. With worldwide earnings of ₹4 billion (US$56 million), Simmba emerged as the third highest-grossing Hindi film of 2018. Khan has next committed to star alongside Kartik Aaryan in Imtiaz Ali's as-yet untitled romantic drama, and alongside Varun Dhawan in Coolie No. 1, an adaptation of David Dhawan's 1995 film of the same name. ^ Sara Ali Khan Answers The Most Googled Questions On Her. Daily News and Analysis. Event occurs at 1:19. Retrieved 11 December 2018. ^ Sara Ali Khan Answers The Most Googled Questions On Her. Daily News and Analysis. Event occurs at 0:47. Retrieved 11 December 2018. ^ "Sara Ali Khan is a bundle of joy as she cuts birthday cake. See more pics from the party". Hindustan Times. 13 August 2018. Archived from the original on 2018-11-17. Retrieved 17 November 2018. ^ Bhagat, Shama (14 November 2018). "Sara Ali Khan leaves it to the audience to accept her in Kedarnath". The Telegraph. Archived from the original on 2018-11-17. Retrieved 17 November 2018. ^ Basu, Nilanjana (3 January 2018). "Saif Ali Khan On Taimur's Gene Pool: Rabindranath Tagore, Raj Kapoor, Tiger Pataudi". NDTV. Archived from the original on 2018-11-17. Retrieved 17 November 2018. ^ "Amrita Singh turns 60: 10 lesser-known facts about the actress". India TV. 11 September 2018. Archived from the original on 2018-12-29. Retrieved 2018-12-29. ^ "Saif Ali Khan reveals, not Sara it was Ibrahim who made debut in Bollywood first". Catch News. Rajasthan Patrika. 28 October 2018. Archived from the original on 2018-11-17. Retrieved 17 November 2018. ^ "Watch: This is what Kareena Kapoor Khan's son Taimur Ali Khan says when he sees his elder sister Sara Ali Khan". Times Now. The Times Group. 17 November 2018. Archived from the original on 2018-11-16. Retrieved 17 November 2018. ^ Mangaokar, Shalvi (11 November 2013). "I am very proud of my Bengali heritage: Saif Ali Khan". Hindustan Times. Archived from the original on 13 September 2016. Retrieved 17 November 2018. ^ Swarup, Shubhangi (29 January 2011). "The Kingdom of Khan". OPEN. Archived from the original on 2 April 2016. Retrieved 17 November 2018. ^ a b "The actress who inspired Sara for a career in films, as revealed by father Saif Ali Khan". Times Now. The Times Group. 2 January 2018. Archived from the original on 2018-11-19. Retrieved 17 November 2018. ^ "Koffee With Karan 6: Sara Ali Khan REVEALS that she wanted to become an actor at the age of 4". Bollywood Hungama. 17 November 2018. Archived from the original on 2018-11-17. Retrieved 17 November 2018. ^ a b "Saif Ali Khan's throwback interview on Amrita Singh: I feel like crying, I miss my daughter Sara all the time". The Indian Express. 23 May 2017. Archived from the original on 2018-11-19. Retrieved 17 November 2018. ^ "We are more like friends, we have drink together: Saif Ali Khan on his relationship with daughter Sara". India TV. Independent News Service. 19 July 2018. Archived from the original on 2018-07-20. Retrieved 17 November 2018. ^ "Sara Ali Khan opens up about step-mother Kareena Kapoor". The News International. 18 November 2018. Archived from the original on 2018-11-17. Retrieved 18 November 2018. ^ "This singer's songs helped Sara Ali Khan to lose weight". Mid Day. 17 November 2018. Archived from the original on 2018-11-17. Retrieved 17 November 2018. ^ Srivastava, Soumya (19 November 2018). "Koffee With Karan 6: Sara Ali Khan says mom Amrita Singh dressed her up for dad Saif's wedding with Kareena Kapoor". Hindustan Times. Archived from the original on 2018-11-19. Retrieved 19 November 2018. ^ Mandal, Manisha (1 December 2018). "Sara Ali Khan Explains Why She Chose To Become An Actress Despite Studying From Columbia". Indiatimes. Times Internet. Archived from the original on 2018-12-12. Retrieved 13 December 2018. ^ a b "Sara Ali Khan reveals story of her dramatic weight transformation, says mom Amrita Singh couldn't recognise her". Hindustan Times. 10 December 2018. Archived from the original on 2018-12-17. Retrieved 17 December 2018. ^ "Sara Ali Khan holds a degree from Columbia University in New York". The Times of India. 1 January 2018. Archived from the original on 2018-11-25. Retrieved 17 November 2018. ^ a b "'Kedarnath' trailer: Love amid catastrophe in film starring Sushant Singh Rajput, Sara Ali Khan". Scroll.in. 12 November 2018. Archived from the original on 2018-11-18. Retrieved 17 November 2018. ^ "Kedarnath: Sara Ali Khan says Sushant Singh Rajput helped her improve her Hindi". Hindustan Times. 14 November 2018. Archived from the original on 2018-11-16. Retrieved 17 November 2018. ^ "Kedarnath vs Zero: Abhishek Kapoor's production parts ways with Prernaa Arora's KriArj Entertainment". India Today. 12 February 2018. Archived from the original on 2018-11-19. Retrieved 17 November 2018. ^ Joshi, Deep (14 November 2018). "Kedarnath: Priests in the shrine town threaten to hold protests if Sushant Singh Rajput starrer is not banned". Hindustan Times. Archived from the original on 2018-11-06. Retrieved 17 November 2018. ^ "Nothing Offensive In Film Kedarnath, Say Makers Amid BJP's Demand For Ban". NDTV. 12 November 2018. Archived from the original on 16 November 2018. Retrieved 17 November 2018. ^ Singh, Kautilya (7 December 2018). "'Kedarnath' movie banned in Uttarakhand, tourism minister says against sentiments of people". The Times of India. Archived from the original on 2018-12-07. Retrieved 7 December 2018. ^ "Sara Ali Khan's debut film 'Kedarnath' opens to mixed reviews". The News International. 7 December 2018. Archived from the original on 2018-12-07. Retrieved 7 December 2018. ^ Guha, Kunal (6 December 2018). "Kedarnath movie review: Sara Ali Khan shines, Sushant Singh Rajput struggles in this Abhishek Kapoor film". Mumbai Mirror. Archived from the original on 2018-12-06. Retrieved 6 December 2018. ^ Iyer, Meena (6 December 2018). "'Kedarnath' Review: Sara Ali Khan shines in this gloomy love story". Daily News and Analysis. Archived from the original on 2018-12-07. Retrieved 7 December 2018. ^ Laha Roy, Tasmayee (6 December 2018). "In the battle of debuts, Sara Ali Khan may come out on top with Kedarnath". Moneycontrol.com. Archived from the original on 2018-12-07. Retrieved 8 December 2018. ^ "Kedarnath Box Office collection till- Now Bollywood Hungama". Bollywood Hungama. Archived from the original on 2019-01-12. Retrieved 23 January 2019. ^ "Ranveer Singh's Simmba in legal trouble for trademark infringement - details inside". Times Now. The Times Group. 14 November 2018. Archived from the original on 2018-11-14. Retrieved 17 November 2018. ^ "Kedarnath: KriArj Entertainment executive alleges Abhishek Kapoor made unreasonable demands during shoot". Firstpost. 13 February 2018. Archived from the original on 16 August 2018. Retrieved 9 December 2018. ^ "Kedarnath makers KriArj Entertainment take their tussle with director Abhishek Kapoor to court". Firstpost. 15 February 2018. Archived from the original on 19 June 2018. Retrieved 9 December 2018. ^ Raman, Sruthi Ganapathy (25 November 2018). "'Some stories choose you and Kedarnath was one of them': Abhishek Kapoor on the film's journey". Scroll.in. Archived from the original on 6 December 2018. Retrieved 6 December 2018. ^ "Kedarnath dialogue promo: Unabashed Sara Ali Khan asks for Sushant Singh Rajput's attention". Times Now. The Times Group. 4 December 2018. Archived from the original on 2018-12-06. Retrieved 6 December 2018. ^ Ronak, Kotecha (28 December 2018). "Simmba Movie Review". The Times of India. Archived from the original on 2018-12-28. Retrieved 28 December 2018. ^ "Bollywood Top Grossers Worldwide: 2018". Bollywood Hungama. Archived from the original on 2019-03-01. Retrieved 1 March 2019. ^ Mankad, Himesh (22 March 2019). "Varun Dhawan finds leading lady for Coolie No. 1 remake in Sara Ali Khan". Mumbai Mirror. Retrieved 23 March 2019. ^ Lohana, Avinash (1 March 2019). "Kartik Aaryan, Sara Ali Khan pair up for Imtiaz Ali's next". Mumbai Mirror. Archived from the original on 2019-03-01. Retrieved 1 March 2019. ^ "Kartik Aaryan and Sara Ali Khan 'caught and clicked' on the sets of their film in Delhi". Daily News and Analysis. 11 March 2019. Retrieved 11 March 2019. ^ "First Look: Sara Ali Khan and Kartik Aaryan are in LOVE in Imtiaz Ali's romance drama, film to release on February 14, 2020". Bollywood Hungama. 20 March 2019. Retrieved 20 March 2019. Wikimedia Commons has media related to Sara Ali Khan.